MY TOP SUMMMER READ FOR 60s COUNTER CULTURE & MUSIC HEADZ…. 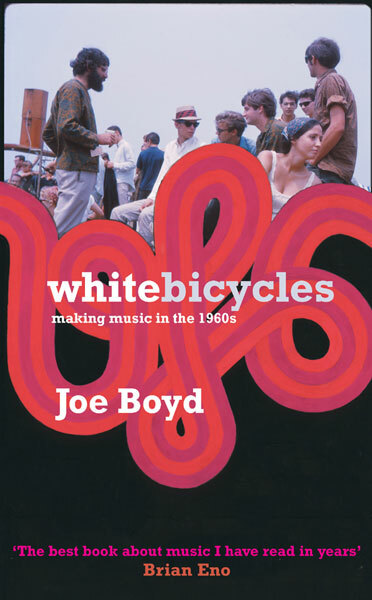 Back in 2006 Serpents Tail published Joe Boyd’s universally acclaimed ‘White Bicyles’ . Its title was inspired by the Dutch Provos communal bicyles in 60s Amsterdam and the 1967 underground hit by Tomorrow, and if a recall correctly Maximus Reinhardt reviewed it for Straight No Chaser. Now, Joe Boyd is a most affable fellow and something of a don and despite Max’s massive big up, to my eternal, shame I’d only dipped in and out the book savouring the odd, most excellent story. However, as I packed my bag for the epic journey to New Zealand I thought suddenly thought White Bicycles would make an excellent traveling companion. I was so-o-o-o right. Wonderfully written this book is a mind blowing journey through music making in the Sixties. What a life the man has led. Joe Boyd rode the wave of a cultural revolution and loved every minute. From tour managing iconic blues and jazz musicians to musicians to stage managing Dylan’s fiercely controversial amplified and electric gig at the Newport Folk Festival (what a story!) to recording the Pink Floyd’s first single, ‘Arnold Lane’ (a song about a knicker sniffer!) to running the legendary UFO – London’s first psychedelic all nighter from the Blarney Club in Tottenham Court Road. to his Witchseason imprint which was the launch pad the Incredible String Band, Fairport Convention and Nick Drake… it’s a tremendous journey. Joe’s book paralleled my own formative teenage years, growing up in the north of England, when I ordered blues LPs and singles like ‘Arnold Lane’ from the guy on the local market, hassled my old man to let me stay up and watch an acoustic Bob Dylan and berated mates for idolising the Incredible String band but still bought the Fairport’s ‘Unhalfbricking’. Reading White Bicycles reaffirmed the energy and the elusive magic of that time. If you’d like a genuine taste of music making combined with Sixties counter culture this book is the lick. This entry was posted in Deep stuff, Just Runnings and tagged Bob Dylan, Chris Blackwell, Fairport Contion, Fairport Convention, Joe Boyd, Nick Drake, Pink Floyd, Release, Serpents Tail, UFO, Witchseason. Bookmark the permalink. 7 Responses to MY TOP SUMMMER READ FOR 60s COUNTER CULTURE & MUSIC HEADZ…. bit bored by White Bikes. Sorry Brad. Please give me some other suggestions. Loved your Cuban/Haitian authors.. You know the sort of thing..
1996.. what am I like … its got to be the jet lag or encroaching senility brought on by memories of the Sixties… yesss… 2006 is when the book came out and right now even that feels like back in the day! Put the 21st June (solstice) in the diary… the premiere of our Sacred Music Sacred Spaces project which features a re-envisioning of A Love Supreme. The performance will be at the Chapel Kings College on the Strand. I’ll send you some info this week… you may want to write about it,,,, if you can get anyone interested! Bell me for a chat about it.